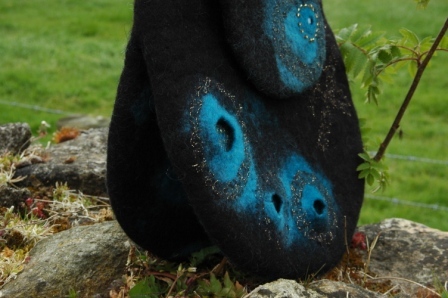 Booking open for my felting workshops at The Tin Thimble, Loomis, CA!!! I am delighted to say that booking is now open for the two felting workshops I will be facilitating at The Tin Thimble in Loomis, Northern California this Fall! We will be kicking off the fun with a two day Complex Felt Bag workshop on Saturday 25th and Sunday 26th September followed by a Nuno Mosaic workshop on Monday 27th September. I am really looking forward to meeting owners Emma and her mother as well as blog readers and friends from Ravelry who are hoping to book into one or even both of the workshops! It constantly amazes me how the internet brings us all together in a virtual sense and it is always fascinating to meet up in reality and confirm friendships forged online. Lasy year I had the pleasure of meeting expert nuno felter Nancy Schwab at Urban Fauna Studio in San Fransisco (dates and venues for the general San Fransisco area to follow in a week or so!) and earlier this summer Jamie and Blas from Urban Fauna paid a visit to me here in Clasheen as part of an extended Ireland and England road trip!!! Mosaic nuno felting was actually the topic I covered in San Fransisco last year and if you are wondering what on earth it entails and would like to see some pictures why not check out this post from October 2009?